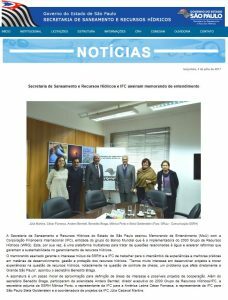 A Secretaria de Saneamento e Recursos Hídricos do Estado de São Paulo assinou Memorando de Entendimento (MoU) com a Corporação Financeira Internacional (IFC), entidade do grupo do Banco Mundial que é a implementadora do 2030 Grupo de Recursos Hídricos (WRG). Esta, por sua vez, é uma plataforma multiatores para tratar de questões relacionadas à água e acelerar reformas que garantam a sustentabilidade no gerenciamento de recursos hídricos. O memorando assinado garante o interesse mútuo da SSRH e a IFC de trabalhar para o intercâmbio de experiências e melhores práticas em matérias de desenvolvimento, gestão e proteção dos recursos hídricos. “Temos muito interesse em desenvolver projetos e trocar experiências na questão de recursos hídricos, notadamente na questão de controle de cheias, um problema que afeta diretamente a Grande São Paulo”, apontou o secretário Benedito Braga. A assinatura é um passo inicial de aproximação para definição de áreas de interesse e possíveis projetos de cooperação. Além do secretário Benedito Braga, participaram da solenidade Anders Berntell, diretor executivo do 2030 Grupo de Recursos Hídricos/IFC, a secretária adjunta da SSRH Mônica Porto, o representante da IFC para a América Latina César Fonseca, a representante da IFC para São Paulo Stela Goldenstein e a coordenadora de projetos da IFC Júlia Cadaval Martins. 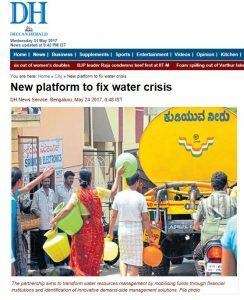 Livemint – 24 May 2017, Bengaluru: The Karnataka government on Tuesday said that it will take up at least 30,000 acres of sugarcane farming land under drip irrigation for a pilot project to highlight the advantages of the low water intensive agricultural practices in the backdrop of unreliable monsoon seasons and resulting droughts leading to increase in the gap between demand and supply of the precious resource. 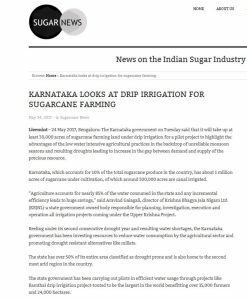 Karnataka, which accounts for 10% of the total sugarcane produce in the country, has about 1 million acres of sugarcane under cultivation, of which around 300,000 acres are canal irrigated. 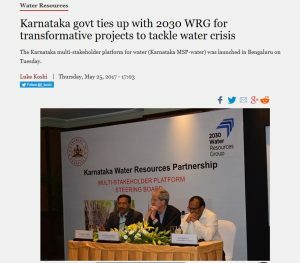 “Agriculture accounts for nearly 85% of the water consumed in the state and any incremental efficiency leads to huge savings,” said Aravind Galagali, director of Krishna Bhagya Jala Nigam Ltd (KBJNL)-a state government owned body responsible for planning, investigation, execution and operation all irrigation projects coming under the Upper Krishna Project. 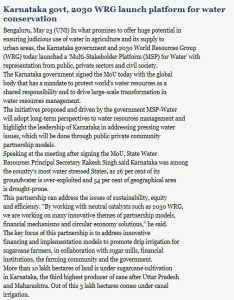 Reeling under its second consecutive drought year and resulting water shortages, the Karnataka government has been investing resources to reduce water consumption by the agricultural sector and promoting drought resistant alternatives like millets. The state has over 50% of its entire area classified as drought prone and is also home to the second most arid region in the country. The state government has been carrying out pilots in efficient water usage through projects like Ramthal drip irrigation project-touted to be the largest in the world benefitting over 15,000 farmers and 24,000 hectares. 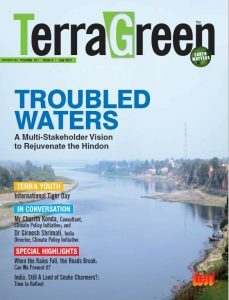 Announcing the launch of a multi stakeholder platform between the state government and Water Resources Group 2030 on Tuesday, experts said that the rapidly growing population will see the urban water demand-supply grow from 24% in 2011 to 58% in 2030 if more efficient agricultural practices are not adopted at the earliest. “Protecting the world’s water resources is a shared responsibility. Our work is based on collaboration among governments, financial institutions, non-governmental organisations, civil society agencies, and companies to close the gap between water demand and supply by the year 2030,” said Bastiaan Mohrmann, co-lead Asia and Middle East for 2030WRG, an advisory group that is trying to bring public-private-civil society collaboration on sustainable uses of water. The pilot project, expected to commence around October, will cost around Rs 1.25 lakh per acre. Galagali said that KBJNL and other agencies have recommended that Rs 85,000 for infrastructure like pumps and pipes be borne by the government and Rs 40,000 by the farmer. He added that the government has spoken to sugarcane farmers, sugar manufacturing companies and banks on the issue to help fund the farmers share of the contribution. Galagali said that sugar manufacturers have agreed to partially guarantee the loans availed by farmers for the proposed project. B.G. 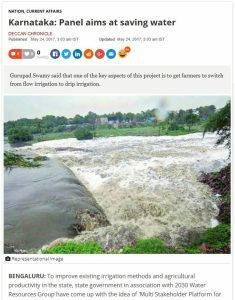 Gurupadaswamy, secretary to Karnataka’s water resources department, said that they had to show the benefits of drip irrigation to farmers for the community-over 75 lakh in the state-to adopt these practices. He said that drip irrigation in sugarcane has been proven to increase the yield by 25-30%, translate into higher returns and result in higher water savings for the state. Mohrmann added that the platform is also promoting drip-to-market agri corridor cluster concept where drip irrigation infrastructure will be connected to sustainable offtake in partnership with buyers for the produce. 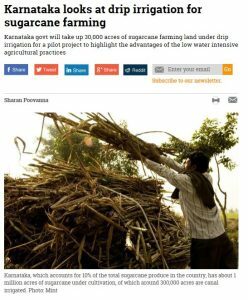 Bengaluru: The Karnataka government on Tuesday said that it will take up at least 30,000 acres of sugarcane farming land under drip irrigation for a pilot project to highlight the advantages of the low water intensive agricultural practices in the backdrop of unreliable monsoon seasons and resulting droughts leading to increase in the gap between demand and supply of the precious resource. 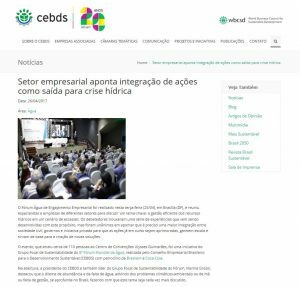 April 26, 2017 – The Business Engagement Forum was held on Tuesday (April 25) in Brasilia, and brought together experts and companies from different sectors to discuss a key theme: the efficient management of water resources in a context of scarcity. The discussants presented a series of experiences that have been developed for this purpose, but they were unanimous in pointing out that a greater integration between civil society, governments and private sector is needed so that the actions already under way are improved, scalable and serve as a basis for new solutions. The event, which attracted about 110 people to the Ulysses Guimarães Convention Center, was an initiative of the 8th World Water Forum, held by the Brazilian Business Council for Sustainable Development (CEBDS) with the sponsorship of Braskem and Coca-Cola. O Fórum Água de Engajamento Empresarial foi realizado nesta terça-feira (25/04), em Brasília (DF), e reuniu especialistas e empresas de diferentes setores para discutir um tema-chave: a gestão eficiente dos recursos hídricos em um cenário de escassez. Os debatedores trouxeram uma série de experiências que vem sendo desenvolvidas com este propósito, mas foram unânimes em apontar que é preciso uma maior integração entre sociedade civil, governos e iniciativa privada para que as ações já em curso sejam aprimoradas, ganhem escala e sirvam de base para a criação de novas soluções. O evento, que atraiu cerca de 110 pessoas ao Centro de Convenções Ulysses Guimarães, foi uma iniciativa do Grupo Focal de Sustentabilidade do 8º Fórum Mundial da Água, realizada pelo Conselho Empresarial Brasileiro para o Desenvolvimento Sustentável (CEBDS) com patrocínio da Braskem e Coca-Cola. Speakers at a workshop on Wednesday emphasised the need for installing full functional effluent treatment plants (ETPs) in the economic zones of the country before industrial plants go into production. They also said the concept of green economic zones will help attract more foreign direct investment in many sectors. 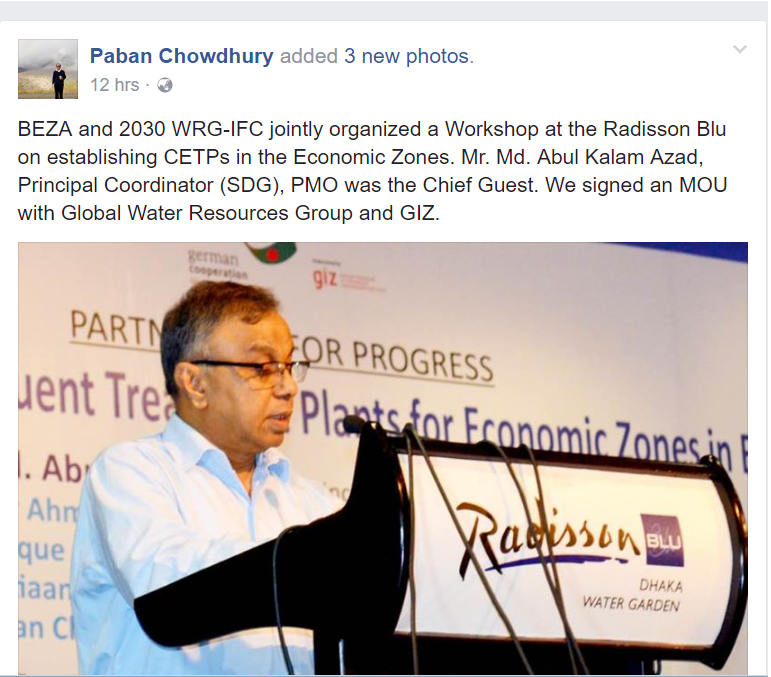 The speakers came up with the views at the workshop titled ‘Central Effluent Treatment Plants (CETPs) for Economic Zones (EZs) in Bangladesh’ jointly organised by Bangladesh Economic Zones Authority (BEZA), 2030 Water Resources Group (WRG) and German development organisation GIZ at a city hotel. Prime Minister’s Office Chief Coordinator (SDGs) Abul Kalam Azad attended the programme as chief guest. Presided over by BEZA Executive Chairman Paban Chowdhury, the workshop was also addressed by Water Resources Ministry Senior Secretary Dr Zafar Ahmed Khan, Ministry of Environment & Forests Secretary Istiaque Ahmad and 2030 WRG Asia Region Co-Head Bastiaan Mohrmann. 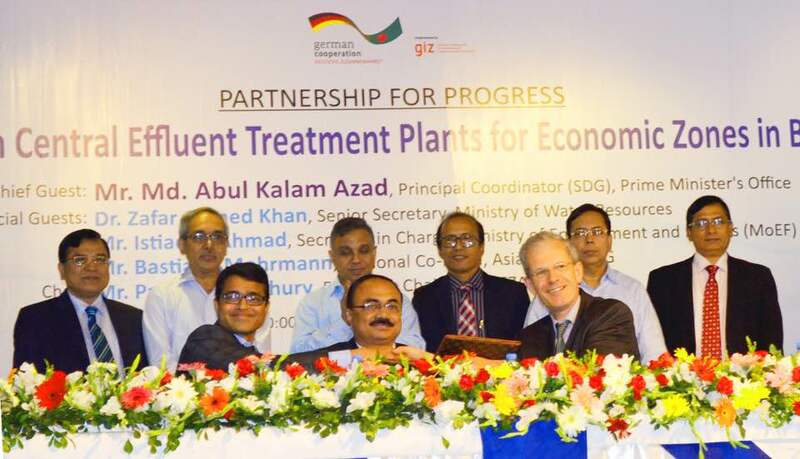 Terming Bangladesh as the most vulnerable country in terms of environment, Mr Azad said the government has taken the plan to establish 100 EZs across the country by 2030 where strict maintenance of CETPs is a must to protect the environment. He said 80 per cent of waste water produced worldwide is discharged without treatment while the rate in Bangladesh is around 99.90 per cent. However, he said there is a scarcity of human resources in the country for effluent and sludge management both in public and private sectors. Despite having significant potential in producing electricity from sludge management, the country has not yet got any success in this regard, Mr Azad added. BEZA Chairman Paban Chowdhury said untreated effluents harm not only surface water but also ground water in the long run affecting reserve of fresh drinking water. Mentioning BEZA’s commitment to protect the environment for sustainable development of the country, he said CETPs in the EZs are considered a viable wastewater treatment solution for industries of all sizes and scales. BEZA has already selected around 36,000 acres of land to establish EZs till now which will reach around 75,000 acres finally, he added. 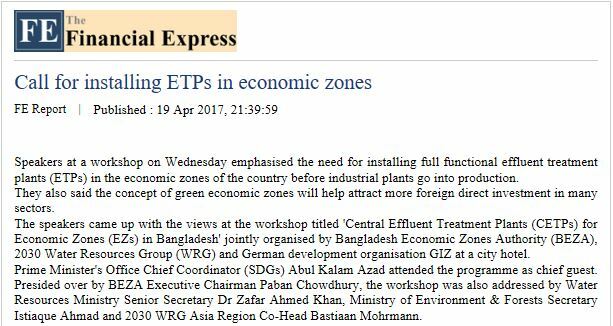 A memorandum of understanding (MOU) was signed among BEZA 2030 WRG and GIZ to initiate a technical and knowledge-based partnership to facilitate establishment of CETPs in the under-construction EZs in the country.FE News Coverage Workshop on CETP 19 April 2017.